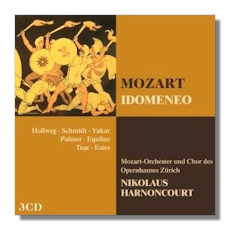 These two Mozart operas continue Warner's excellent reissue programme related to the extensive discography of the octogenarian Nikolaus Harnoncourt whose performance style in these sublime works is nothing short of revelatory. 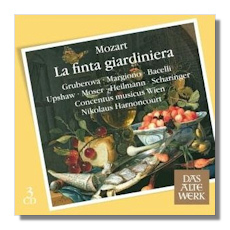 "La Finta Giardiniera" is perhaps one of the lesser appreciated operas by this composer but it is full of some very fine arias and ensemble pieces which finds Harnoncourt in inspired form throughout. Edita Gruberová's "Sandrina" is particularly intriguing whilst the other roles are also finely executed by such luminaries as Monica Bacelli and the relatively young Dawn Upshaw in this excellent 1991 recording. This "Idomeneo" takes us to Zürich from Vienna and again Harnoncourt finds much fire and passion in a work which is notoriously difficult to bring off. My selected comparison here was the indefatigable Peter Maag (Arts Archives) whose litheness of tempi and superb singing team is given a good run for their money by Harnoncourt and in particular the booming voice of Hollweg who can safely lay claim to be one of the finest Idomeneo's on record. Yet again Harnoncourt is a thrilling exponent of the Mozartian idiom and the opera really finds a dramatic twinge especially in the final act. Both sets lack a libretto which however may be downloaded from Warner's website. Otherwise these attractively priced recordings are must haves for any Mozart opera collector who does not yet have them in their repertoire.